NISSAN SUNNY Mk III (N14) 2.0 Saloon Petrol 08/1990 12/1996 FWD 16 141 104. NISSAN SUNNY Mk III Hatchback (N14) 2.0 GTI 16V Hatchback Petrol 10/1990 05/1995 FWD 16 143 105. NISSAN SUNNY Mk III Hatchback (N14) 2.0 GTI-R 4x4 Hatchback Petrol 10/1990 05/1995 AWD 16 220 162. 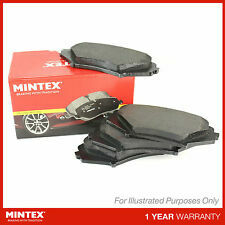 MINTEX CAR BRAKE PADS MDB2755 Replaces 410606N091,410606N0X1,4106095F0A,4106095F0B,D10606N091,D10606N0X2,AN614WK,DB1454,ADN142125,0986495146,P56083,8228100,LP2184,121208,8260,355020041,8DB355020041,181635,MD1233M,363700201874,T1874MM,2208100,MDB82755,D1233M,N3601097,PF2435,12266,T1874,112302,2112302,32918,2464701,2464703,TX0017,8260,GDB3563,598747. Fitting Position : Front Axle. Quantity : 4. NISSAN 41060-95F0B. MITSUBISHI MN102192. MAZDA 1N13-33-28Z. OE Numbers. Brake System : Akebono. NISSAN D10606N0X2. NISSAN D10606N091. NISSAN AY040NS108. NISSAN AY040NS100. NISSAN AY040NS096. NISSAN AY040NS084. NISSAN AY040NS073. Mintex Manufacturer’s Warranty is a 1-year/15,000 miles no quibble policy excluding general wear and tear. Quantity Included: 4 Pads - Axle Set. We apologise in advance for any inconvenience caused. Part Number:P56083. Fitting Position Brake System Be aware that each model of vehicle may have a choice of few different part options. Such variations can apply due to upgrade designs on later chassis numbers, or the manufacturers using different OEM suppliers during production process. Part Number:GDB3115. Fitting Position Be aware that each model of vehicle may have a choice of few different part options. Such variations can apply due to upgrade designs on later chassis numbers, or the manufacturers using different OEM suppliers during production process. Part Number:JQ101297. Fitting Position Then at our discretion we will decide the next course of action. Be aware that each model of vehicle may have a choice of few different part options. Such variations can apply due to upgrade designs on later chassis numbers, or the manufacturers using different OEM suppliers during production process. Part Number:GDB1175. Fitting Position Be aware that each model of vehicle may have a choice of few different part options. Such variations can apply due to upgrade designs on later chassis numbers, or the manufacturers using different OEM suppliers during production process. Part Number : MDB2755. Brakes are one of the most important safety systems fitted to every vehicle. Brake system components should be regularly checked and thoroughly looked over as part of your vehicles service. Fitting Position Brake System Be aware that each model of vehicle may have a choice of few different part options. Such variations can apply due to upgrade designs on later chassis numbers, or the manufacturers using different OEM suppliers during production process. Part Number:C21030ABE. Fitting Position Brake System Be aware that each model of vehicle may have a choice of few different part options. Such variations can apply due to upgrade designs on later chassis numbers, or the manufacturers using different OEM suppliers during production process. BORG & BECK BBP1156. Brake Pads Set. Just ask us and we can do a much better check. MINTEX • MDB1920. DELPHI • LP1506. Manufacturer Part Number 05P929. Use engines info and vehicle YMM compatibility chart for general guide. Strictly important to provide VIN along with your detailed request since there can be different options for your car specific tech characteristics. Manufacturer Part Number 05P602. Use engines info and vehicle YMM compatibility chart for general guide. Strictly important to provide VIN along with your detailed request since there can be different options for your car specific tech characteristics. Manufacturer Part Number ADN14244. Use engines info and vehicle YMM compatibility chart for general guide. Strictly important to provide VIN along with your detailed request since there can be different options for your car specific tech characteristics. Manufacturer Part Number LP971. Use engines info and vehicle YMM compatibility chart for general guide. Strictly important to provide VIN along with your detailed request since there can be different options for your car specific tech characteristics. Nissan 100 NX (B13) 1.6 66KW 90HP 1990.03 - 1994.10. Nissan 100 NX (B13) 1.6 SR 75KW 102HP 1993.09 - 1994.10. Nissan 100 NX (B13) 2.0 GTI 105KW 143HP 1991.03 - 1994.10. Nissan MAXIMA QX (A32) 2.0 103KW 140HP 1995.02 - 2000.08. Nissan 44060-0M892, 44060-0M890. Nissan PULSAR I Saloon (N15) 1.6 1.6 L / 1597 cc 1995.07 - 2000.05 73 Kw / 99 HP Fitting Position: Rear Axle,Construction year to: 01.1998. Nissan PULSAR I Saloon (N15) 1.6 1.6 L / 1597 cc 1995.09 - 2000.07 86 Kw / 117 HP Fitting Position: Rear Axle,Construction year to: 01.1998. HELLA Brake Pad Set, SBB, Manufacturer Item no. 8DB 355 020-041, EAN: 4082300404586. sku: 8DB 355-020-041. Marke Hella. is fast, competent, and cheaper than ever before! EIA cover unit: Set. MSRP value: 646. Nissan 100 NX (B13) 2.0 GTI 105KW 143HP 1991.03 - 1994.10. Nissan SUNNY III Hatchback (N14) 2.0 GTI 16V 105KW 143HP 1990.10 - 1995.05. Nissan SUNNY III Hatchback (N14) 2.0 GTI-R 4x4 162KW 220HP 1990.10 - 1995.05. NISSAN SUNNY Mk III Hatchback (N14) 2.0 GTI 16V Hatchback Petrol 10/1990 05/1995 FWD 16 143 105. NISSAN SUNNY Mk III (N14) 2.0 Saloon Petrol 08/1990 12/1996 FWD 16 141 104. NISSAN SUNNY Mk III Hatchback (N14) 2.0 GTI-R 4x4 Hatchback Petrol 10/1990 05/1995 AWD 16 220 162. Part Number:GDB3181. Fitting Position Be aware that each model of vehicle may have a choice of few different part options. Such variations can apply due to upgrade designs on later chassis numbers, or the manufacturers using different OEM suppliers during production process. Brake System Akebono. IN DOUBT WHETHER IT WILL FIT?. We always will do the best for both sides to be happy! AND WE WILL DIRECT. YOU TO CORRECT PARTS! (incl: NORWAY & SWITZERLAND). If the item is used, we are unable to accept the goods back.